People buy ATVs for transportation primarily. But did you know that your ATVs can serve so many functions aside from that? It can be your best weed removal tool, lawn raker, land mower, seed spreader and it can even be a snowplow! Since it’s basically still winter, let me give you the most reliable ATV Snowplow Reviews today. So prepare your all-terrain vehicle now for you are going to give it an overhaul. This particular vehicle started in Japan and was only brought in the United States of America in the 1970s. On top of the above-mentioned gardening functions, an ATV can also be your best buddy when you are hunting, renovating your house, camping, and lifting heavy things. ATVs are classified according to their functions. There are utility ATVs which has a huge engine and lots of working accessories. There are also all-terrain vehicles that are used for sports; hence, we call the sports ATV. Lastly, there are ATVs known as side by side or SxS. Basically, the function of this is to transport passengers and baggage. If you have an ATV, it makes no sense to continue removing the snow in your area manually. Why will you get tired, waste effort and strain your back muscles if you can simply utilize your all-terrain vehicle and temporarily turn it into a snow plowing machine? After a snow storm (or an ordinary snowfall), we will soon have to take care of the snow along our pathways. You can take full advantage of your all-terrain vehicle by this point by just mounting an ATV snowplow. Okay, so now you know that your ATV can also b e a snow maintenance tool, now what? It is time for you to learn how to install the equipment correctly so it will not cause any frustrations as you use it. Yes, you have read that correctly, it can be stressful. The wrong method of setting up your snow plow can lead to the destruction of your snow plow, or the pavement or it could cause untoward accidents. The capability of your ATV to handle snowplows should be assessed first Not all ATVs can be used for this specific function. Technically speaking, kid’s all-terrain vehicle will automatically be disqualified. It would also be improper to use snowplows with your sxs, although I am not saying it cannot be done. The mounting and base parts would serve as your handles. If these portions of your ATVs are not sturdy enough, they would just bend or snap when you use them through the snow. The size of the snowplow differs from one manufacturer to another. There are snowplow blades which cannot fit perfectly in some mounting accessories. Check the snowplow dimensions. Others are too heavy or too thick that the iron mount cannot hold it. Make sure you check the compatibility first or else you will waste energy and possibly money to return the item for exchange. The durability of the snowplow should also be taken into consideration. Most snowplows are made of steel. Other manufacturers offer carbide, it is harder, yes, but it is brittle at the same time. This means it can chip or crumble. Did I mention carbides are also very pricey? The budget you allocated to buy will tell you whether a product is a perfect fit for you. Some items on the market are expensive because they promise higher quality. This may not be true for all occasions. You have to do some researches to check out more affordable snowplows options that can perform impeccably. 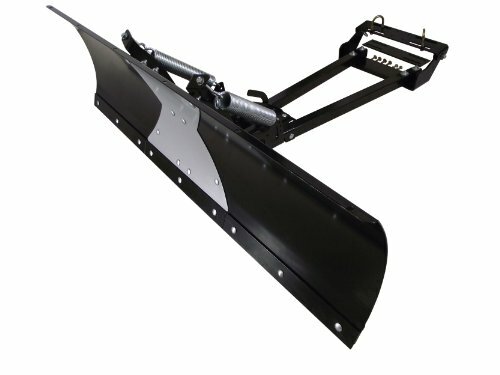 This product comes with replaceable wear bars, straight plow blade, push tubes, modifiable skid feet, and installation hardware. Unlike other plows, this product does not need to be placed on the front part of your wheel hence, damage from unexpected impacts will be avoided. 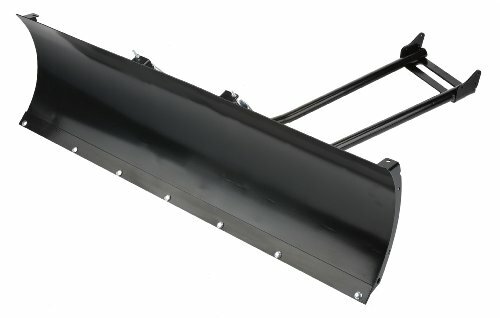 If you would like a plow which you can utilize for all seasons, this is the perfect product for you. Although I can easily install and dismantle it from your ATV, I would not. This is simply because I can use it with for my gardening needs as well! This product is 50 inches wide and 16 inches tall. It also has grade 50 gussets, steel wear bar, and skid pads. This gadget allows your plowing force to be readjusted to make your plowing experience more successful. If you want to lessen the hassle of finding the perfect mounting accessories for your ATV, go for this product. Tough materials and complete accessories, what else could you ask for? Did I hear you say low price? Ah, I am sorry to burst your bubble but this product comes with a hefty price tag. This plow can grip perfectly to many kinds of all-terrain vehicles. The bar is also perfectly angled to scrape up pathways faster and clearer. It comes with steel frame and other necessary tools for installation purposes. This product would be convenient for you since you can easily install and remove it. If you are after longevity on the other hand., you have to take extra effort in cleaning and drying this snow plow as it will become rusted if you do not. Having ATV snowplow is practical. You just have to remember the guidelines we discussed here such as checking ATV’s capability, toughness and compatibility of your mounting and base parts, size, and durability of the snowplow and most of all your budget. Proper installation, use, and maintenance will also help you prolong the lifespan of your ATVs. 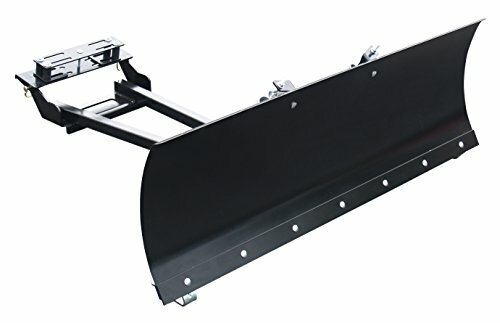 Without further ado, I would like to highly recommend the best of the bests ATV snowplow which is: Extreme Max 5500.5010 UniPlow One-Box ATV Plow. It is durable, it is compatible with the majority of the ATVs in our country, it is not that expensive as others, it is made up of durable materials and has functions that make this product very convenient in addressing snow issues. True to their promise, everything that you need to install and use this item can be found in one box! I hope you enjoyed this article. Feel free to hit us up when you have feedbacks about the three suggested snowplows. We would also love to know if you have other recommendations!